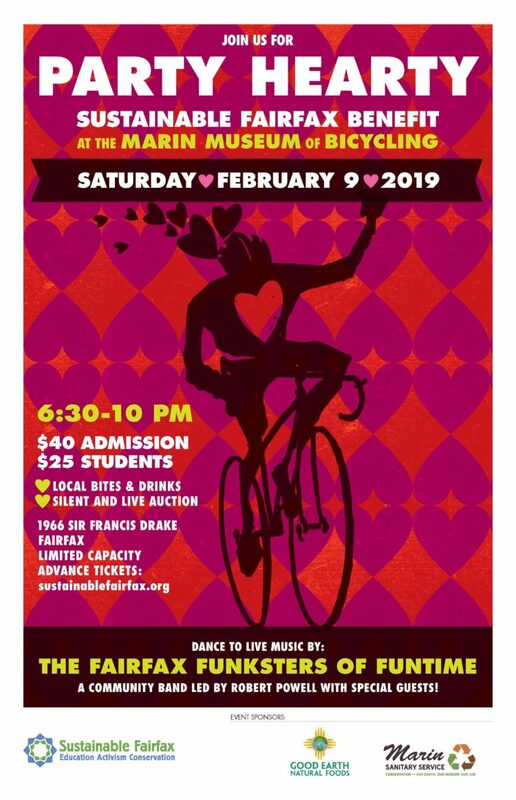 Sustainable Fairfax is throwing another lively party at the Marin Museum of Bicycling on Saturday, February 9th, 2019! Enjoy a night of music, dancing, local bites, drinks.. and an evening celebrating February LOVE. 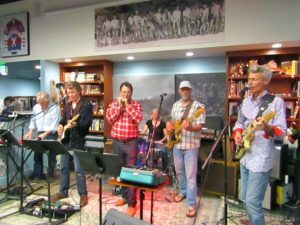 Fairfax producer/musician extraordinaire Robert M Powell will lead the Fairfax Funksters of Funtime, a ‘community band’ that includes many special guests. Enjoy light local fare, beer, wine and non-alcoholic beverages. Bid on local goods and services at our annual silent auction. And don’t miss the LIVE auction, back again this year! FOOD: The event features tasty bites from local favorites: Enjoy vegan cheese from Miyoko’s Kitchen, as well as cheese from Nicasio Valley Cheese and Point Reyes Farmstead Cheese Company; tasty food from Sorellas; quesadillas from Grillys, and pizza from Ghiringhelli’s. DRINKS: We will serve beer donated from Iron Springs Pub and Lagunitas Brewery; organic/biodynmamic wine from Frey Vineyards; and non-alcoholic “shrubs” with Amphora Nueva balsamic. ONLINE TICKET SALES ARE CLOSED, BUT YOU CAN COME AND PAY AT THE DOOR! Can’t make the party and still would like to support our work? Donate below! Consider a monthly recurring donation- check out our 2018 accomplishments HERE.